Chinmaya College of Arts Commerce and Science, Tripunithura has advertised in THE HINDU newspaper for recruitment of Teaching Faculty jobs vacancies. Interested and eligible job aspirants are requested to apply within 10 day from 08th August 2018. Check out further more details below. About College: Chinmaya College of Arts, Commerce and Science is a premier institute of higher education affiliated to MG University, Kottayam, Kerala. Located in Ernakulam, the institution is known for its excellent record in academics and co-curricular activities. 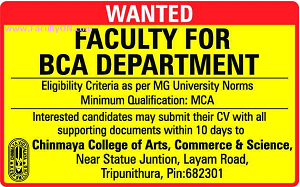 Minimum qualification is MCA and As per MG University norms. How to apply: Applicants are requested to send their applications with CV, copies of certificates and recent PP size photo to the postal address within 10 days.